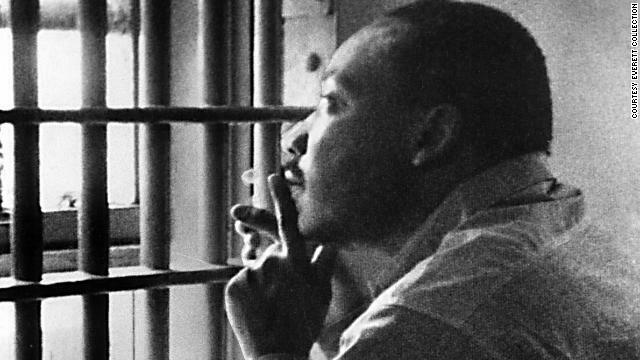 Inspirational... MLK faced adveristy that most of us could only imagine. Intelligence, Faith, foresight, etc, helped him persevere. How the heck does ANY of us become angry?!? Not feeling respected would be a given. I became angry at the grocery bagger for putting my raw chicken on top of the eggs. Hmm...maybe I should write an article about how I became an "Angry Grocery Shopper." As if much has changed... I guess its all in prospective. What would Dr. King say about this...? Haters will hate, affirm: "I love all humanity regardless of ethnicity, race or religion." Wow what a load of crap. This author really knows nothing nor does he attempt to correct himself. I wonder if the author was to sit in a dirty jail cell for whom knows how many days, would he feel the same about the people who put him there? This is how far CNN will go to get people to read this crap. Thanks for reminding me again why there is no real news, because it's all a ploy to grab ratings. Wow, from where I sit reading this revisionist article it's deja vu all over again, as Yogi Berra would have put it, in the Deep South. Knowing that CNN is quartered in Atlanta I'm not surprised that the author does not acknowledge that a man's works are not measured by his mistakes or the erred views he may have espoused along the way, but by the the value and depth of their end results. But alas, thus it goes in the South still, white's contempt for blacks, black's contempt for whites and the contempt of both for everybody else, or as the saying goes in Deep Dixie, "It ain't what you know, it's who you know." (This from someone who lived in Augusta for eight loooong years). MLK was killed by J Edgar Hoover and CNN wants to call him a angry black man. It's about time our government admitted to the wrong doings of the past. Our govt? Ha no. your govt maybe.